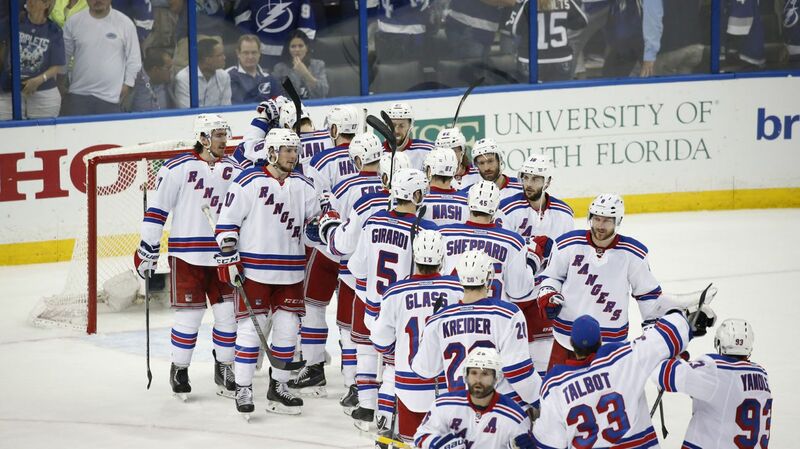 The Rangers fell short of their lofty expectations in the playoffs. These are a few things that they needed to do better. Photo courtesy of MSG Photos. A promising season led to postseason disappointment for the Rangers, falling short of their Stanley Cup goals, and losing to the Tampa Bay Lightning in Game 7 of the Eastern Conference Finals. They came just 20 minutes shy of a second consecutive Stanley Cup Finals berth. After acquiring Keith Yandle at the trade deadline, many believed that this put the Rangers in a “win-now” mode. The players had these same expectations, which is why they too seemed disgruntled during their exit interviews yesterday. A lot of people thought that this was the year that the Rangers would finally recapture the Stanley Cup after 21 long seasons. But there were injuries, failed game plans, as well as a strong Tampa Bay team standing in their way. Hindsight is 20/20, so here is what the Rangers needed to do differently or better in order to win. In the first two rounds of the playoffs, the Rangers’ offense was nonexistent. The 12 games against the Capitals and Penguins were all decided by just a single goal, whether it was a win or a loss for the Rangers. Some of their goal scoring troubles can be attributed to the play of opposing goalies. Marc-Andre Fleury performed well for Pittsburgh despite their injury-riddled defensive group. He kept the Penguins in every game, and made the series much more interesting. Braden Holtby was outstanding, furthering the argument to classify himself as one of the elite goalies in the league. Holtby allowed just 13 goals in the seven games series, and stole a few games away from New York. Lundqvist vs. Holtby may have been the best playoff goalie duel ever. But the series against Tampa was a different story. Ben Bishop wasn’t a difference maker, and allowed a total of 15 goals against him in the three games at Amalie Arena. He wasn’t never really challenged that much in the losses, and when he was challenged, the Rangers were usually able to get pucks past him with ease. The first two rounds could have been over much more quickly if New York capitalized on their best chances. There were a lot of hit post, hesitation when it came to shot selection, passing too much, or not placing the shot well. It was a problem that plagued the Rangers through the first 12 playoff games, as well as the four home games against the Lightning. 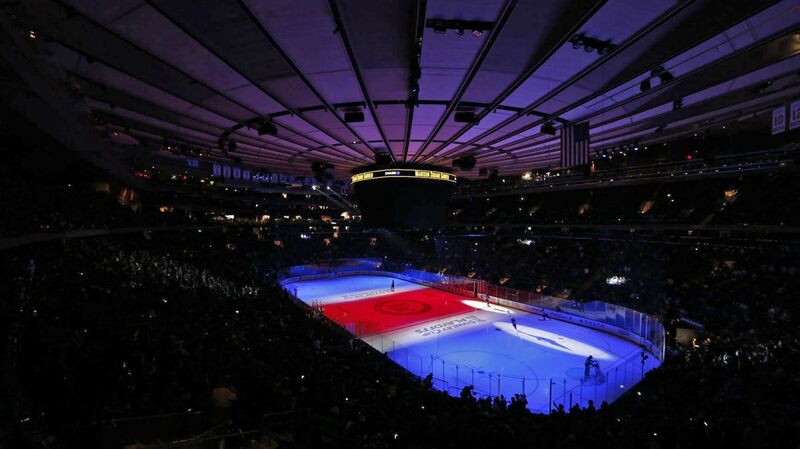 Madison Square Garden during the playoffs can often be loud and a tough place for opposing teams to play in. Photo courtesy of MSG Photos. This is referring to the Eastern Conference Finals only. The Rangers fought hard to earn the Presidents’ Trophy during the regular season, giving them home ice advantage throughout the entire playoffs. In the first two rounds, they were very strong at the Garden, posting a 5-2 record against the Penguins and Capitals. The series against the Lightning was a different story. The Rangers were just 1-3 at Madison Square Garden, winning Game 1 by a score of 2-1, ad losing Game 2, 5, and 7 by a combined score of 14-2. They were shutout for the final seven periods at the Garden, and mustering just 48 shots on goal in the two shutout losses of Game 5 and 7. The parallels between their home performance and road performances are odd. They scored 17 goals in three games in Tampa Bay, earning two wins, but scored only four goals at home, and winning just once. Their inability to take advantage of playing in their own arena was a big reason why they were eliminated. The Rangers’ power play was improved in the playoffs, but they were ultimately unable to use the power play as a weapon in many key situations. The Rangers scored six goals against the Penguins and Capitals combined on 48 opportunities (12.5%). Against the Lightning, the Rangers scored 7 power play goals on 24 opportunities (29.2%). That percentage is good, but the Rangers lost when they couldn’t score on the man advantage. In Game 5, the Rangers were 0-4 on the power play, which swung momentum back in Tampa’s favor, and allowed them to rally with two goals. 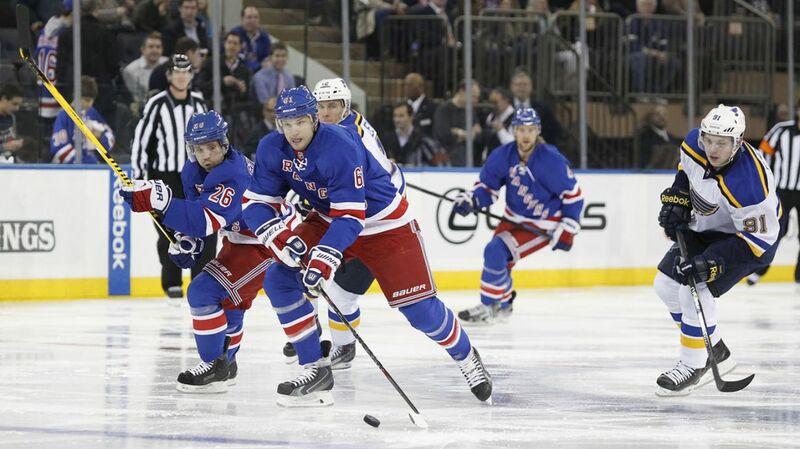 The Rangers also failed on both opportunities in Game 7, with just two shots on goal, and only seven shot attempts. Ultimately, the missed opportunities on the failed power play attempts were a turning point in both of those games, and in the series as a whole. One of my biggest gripes with how the Rangers played is their unwillingness to get to front of the net, and score those “dirty” goals that are so important in the playoffs. It happened occasionally, but not consistently enough. In all three series, this wasn’t happening enough. There weren’t enough screens, battling in front of the net, or rebound goals. All of this occurred because the Rangers weren’t usually there, or allowed the defenders to push them out of the zone. Rick Nash, Kevin Hayes, Chris Kreider, JT Miller, and a few other players are all big, but they didn’t take advantage of it often enough. Size doesn’t matter when it comes to traffic, because anyone can deflect a puck in or score on a rebound. This also relates to driving to the net. The shot charts will say otherwise, but it felt like the Rangers took a lot of shots from the perimeter. Rick Nash, Kevin Hayes and others didn’t use their speed to cut to the front of the not often enough, which usually creates good scoring chances. Broken plays are some of the best ways to score a goal in the NHL. The Rangers didn’t score on these enough, or make much of an effort to score in that way. The Rangers needed more consistent production from guys like Rick Nash and Martin St. Louis to make a long run in the playoffs. Photo courtesy of MSG Photos. The line of Nikita Kucherov, Ondrej Palat and Tyler Johnson, and their success, had been well documented throughout the regular season and playoffs. Everybody knew they’d be very important and dangerous against the Rangers. Despite New York’s stout defensive core, the triplets were very effective, with eight goals and 16 points in the first three games. The Rangers held them off in Games 4-6, allowing two meaningless goals to Nikita Kucherov, and six total points. But in Game 7, they stepped up, scoring both of the goals en route to a win. They totaled 11 goals and 24 points. Yes, the Rangers defense was riddled with injuries. But that’s not enough to excuse the fact that Kucherov, Johnson and Palat practically walked through the Rangers’ defensemen throughout the series. Guys like Dan Girardi, Marc Staal and Kevin Klein, known as “shutdown defenders,” needed to be better. The Lightning had Steven Stamkos, Ondrej Palat, Tyler Johnson and Nikita Kucherov. All of them stepped up, and did exactly what was expected of them as the superstars of the team. The Rangers really didn’t their best guys step up as an answer. Derick Brassard had the massive three goal, two assist night in Game 6, but still managed to total eight points over four separate games. I’m not going to criticize Rick Nash too much. Unlike many other people, I think this was actually a much better playoff performance from him. He had a much bigger impact while still playing a strong possession game and defensive game. Nash finished with seven points in the series against Tampa. While that obviously sounds fantastic, it’s a bit misleading, because he totaled 7 points in just two games. In the other five games, he was held without a point. Nash was a force to be reckoned with during his two goal, one assist performance in Game 4, and his one goal, three assist Game 6. If he doesn’t have those performances, you can argue that the Rangers don’t get to Game 7. But the truth is during those other five games, Nash didn’t have much of an impact. Nash needed to spread out his point production, and be more of a difference-maker in the other games. Whatever way you look at it, Martin St. Louis was brought in with expectations of being a top-six forward. This year, it seemed like his age had caught up with him, and he really struggled to produce in the playoffs, scoring just one goal with six assists. He didn’t fulfill that top-six role, and didn’t help the team out much in the postseason. Tampa’s top performers stepped up consistently. The Rangers’ top performers did not. Posted on June 2, 2015, in In the Crease and tagged Alain Vigneault, Cam Talbot, Carl Hagelin, Chris Kreider, Dan Boyle, Dan Girardi, Derek Stepan, Derick Brassard, Dominic Moore, Henrik Lundqvist, James Sheppard, Jesper Fast, JT Miller, Keith Yandle, Kevin Hayes, Kevin Klein, King Henrik, Madison Square Garden, Marc Staal, Martin St. Louis, Mats Zuccarello, Matt Hunwick, MSG, MSL, New York Rangers, NHL, NHL 2014-2015 Season, NHL Playoffs, NY Rangers, NYR, Rangers, Rangers Nation, Rangerstown, Rick Nash, Ryan McDonagh, Stanley Cup Finals, Stanley Cup Playoffs, Tanner Glass, The Ranger Zone. Bookmark the permalink. Leave a comment.